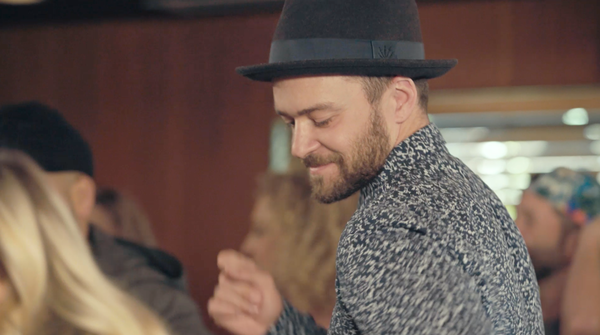 Justin Timberlake Archive - New Single! "Can't Stop The Feeling!" You are here: Home / News / New Single! "Can't Stop The Feeling!" New Single! "Can't Stop The Feeling!" Ready. Set. Dance. Justin has just released an infectious new single "CAN'T STOP THE FEELING!" from the upcoming DreamWorks Animation film Trolls - the perfect song to kick off an instant dance party! Proof? Watch the First Listen video below as Justin, his friends and family, as well as some of the cast of Trolls, listen to the song for the first time. We promise - you won't be able to stop yourself from dancing along! "CAN'T STOP THE FEELING! ", produced by Justin Timberlake, Max Martin and Shellback, is the first single for the soundtrack for the film Trolls, which boasts an all-star cast, including Justin and Anna Kendrick, Gwen Stefani, James Corden, Ron Funches, Kunal Nayyar and the band Icona Pop as seen in the video!! P.S. You have your own dance moves using the hashtag #CantStopTheFeeling so Justin can see them too! Our favorite song right now by far! Please watch our music video! I love you Justin <3 <3 <3 ! This single is perfect ! I love this one so much !!! I posted 2 videos of me dancing to Can't Stop The Feeling. One I was at work in my dental office all by myself. The other one was when I came home and continued the dance party. I've been dancing all day to this song!! It's going to be the song of the summer!! I love love love this song. It's so fun. Can I be in the dance video? Lol jk im 2 old for that. .but I can do the two step..???? Amazing!!! Like always! I LOVE IT!!!!!! !